Last week I was feeling on the verge of "under the weather." I just felt "off" all week. It started on Sunday, but with nothing really specific. Monday morning, I felt like someone had hit me in the stomach the day before and ran my 9 miles not knowing if I would throw up. Tuesday and Wednesday were just mildly yucky feeling, nothing in particular really. Thursday I had the most horrible migraine that of course led to nausea and light/sound sensitivity. Friday I had a low grade fever and was very lethargic. And yesterday (Saturday) I woke up feeling fine...finally! Yesterday, I went to a scrimmage hockey game with my friend Amanda. It's been a while since I went to a hockey game...I forgot how cold it is in there. After the hockey game, we went to IKEA and I bought a silicone loaf "pan" and then promptly decided that today I would bake some zucchini bread. After IKEA we went to the craft store and I got some another book of scrapbook background pages and some notepads that were cat themed. Then, on the way back to my apartment, we made one last stop at Garden Ridge (they are having a huge clearance on everything in the store) because I wanted to see if they still had any large mirrors. I want to be able to take full body selfies without the bathroom sink being in the picture (and of course, those aren't actually full body because I'm cut off just below the hips). I got a 35x23.5 inch mirror for $14.99!!! This mirror was regularly priced at $49.99. NICE!!! So, be expecting some full body pics in the future. Something else I did yesterday was do some grocery shopping. I got everything I need to make Bainghan Bharta (Indian eggplant curry), plus some lamb meat to throw in to make it a main dish instead of a side dish. I sauteed up the onions, garlic and spices, then cubed the eggplant into tiny cubes and mixed everything together and set it in the refrigerator to set overnight like the recipe says to. While out shopping for everything I needed for the eggplant curry and for the zucchini bread, I stumbled upon an amazing deal. You see, I've been wanting a second crockpot in case I want to cook 2 different things at the same time. Also, my crockpot that I've had is ceramic and has been cracked ever since I first had it because immediately after using it for the first time, without letting it cool all the way, I put tap water in it to clean it and it cracked. It doesn't leak, but really, it's only a matter of time. So, anyway, I was in the kitchen gadgets section of the grocery store and was looking at their crockpots. They had this Hamilton Beach stovetop programmable crockpot. It was regularly around $60 but they only had the display model left (so no box) and it was on clearance for $32.48. On top of that, they had a coupon for $5 off any crockpot. 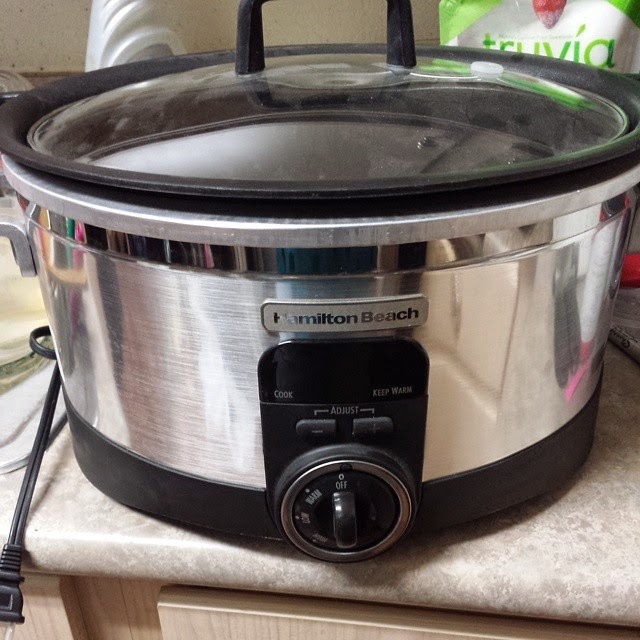 So, I got a $60 totally awesome crockpot for $27.48. BOOM! So, guess what I'm cooking my eggplant curry in right now? Yep, the new crockpot. It's awesome because you can set the time on it and it will shut off when the timer runs out. YAY! Oh, and it has 3 settings instead of the standard 2. It has the standard High and Low, but it also has a Warm setting. So, great for using for a spread where you want something to stay warm for a few hours, like queso or another dip at parties. I am going to head back to the grocery store and get the makings for a skinny shrimp alfredo pasta bake. I'm a cooking/baking fool today! I'm really making an effort with the no restaurant food challenge. Now, I do need to be honest. I had some baked salmon with a dressing-less bean salad at IKEA yesterday, but it was very healthy and it was definitely something I could have made at home. It came with a horseradish dip for the salmon and, while yummy, I preferred the salmon without it. I just got done with a great 4 mile progressive run. Now to stretch, hit the shower and go to the grocery store again! And now for a little "would you rather" action! I love 5K’s…they’re fun, you can go all out running them without killing yourself and get a great time, and they don’t take much commitment training wise. But, the main reason I love a 5K is they are runs that are usually a lot of fun to do. My favorite 5K I’ve done so far is the Superhero 5K I did recently. My second favorite was the Stand Up 5K from earlier this year when I got my 5K PR (I would have gotten an AG medal too if the race directors had done 5-year AG’s instead of 10-year ones). I would say that I would rather run a marathon simply because it is something I really want to do and plan to do (on my birthday in December). I will let you know after the marathon if it is something I will ever do again, though. There’s a chance I won’t simply because of all the commitment that training for one requires. Hilly race in the cold. I hate running in the heat. Hate. It. Definitely new shoes. I loooooooove running shoes. I have loads of running outfits, so I don’t really need any more of those right now. Haha. 4. Would you rather run a race without headphones or without a Garmin? Without headphones. I gotta have my Garmin and my data. Just gotta. I don’t need to look at it while I run my race, but I need it afterward so I have my data. 5. Would you rather run on the treadmill for an hour or in a circle around the same street for an hour? After a little thought, I’m going to go with in a circle around the same street. I really hate the treadmill. Even if it’s the same scenery over and over again for an hour, it’s far preferable to the extreme boredom a treadmill subjects me to. 6. Would you rather run a Ragnar Relay or a marathon relay? I’m going with Ragnar, hands down. I would absolutely LOVE to run a Ragnar. A large portion of the blogs I follow and read have either already done a Ragnar (or Ragnar-like…Hood-to-Coast, for instance) and I love reading their posts about the experience. There’s so much teamwork between people that don’t know each other and it’s just awesome. 7. Would you rather come in 4th in the Olympics or 1st in the New York City Marathon? I would rather be 1st in the NYC marathon. I love the Olympics, but there’s just not the crowd support that there is for “regular” marathons with the signs and the people cheering you on and the cowbells and other noisemakers…no small children to give you a high-5 as you run by. It’s all about the entire experience for me. 8. Would you rather give up running for 1 year to get a BQ (Boston Marathon qualifying time) or never BQ but run as much as you want? Boston really is my dream. It really is. So I think I would have to make that sacrifice and not run for a year. I could keep in shape in other ways…cycling, swimming, elliptical and, of course, strength training. 9. Would you rather run in an urban area or on a trail? Urban area…for many reasons. First, I’m a klutz and the likelihood of getting hurt on a trail run is just too great for me…otherwise I think I would enjoy it greatly. Second, if I need help for some reason, it’s easier to find in an urban area. Also, I can run in the dark in an urban area and be safe…you can’t really run a trail in the dark, even with a good headlamp, safely…in my opinion (that’s the opinion of a klutz, btw). 10. Would you rather have a headache during a run or a side stitch? I think I’d rather have the headache. A headache I can ignore. A side stitch is sharp and is not something I get frequently (I get headaches somewhat often…I need to go to the doctor) so I wouldn’t be able to ignore it. 11. Would you rather run in a thunderstorm or a snowstorm? Thunderstorm. I have loved thunderstorms since I was little. My parents used to let us stay up late and watch them out the dining room window. And I ran in the rain for the first time ever a few weeks ago and it was a great experience. 12. Would you rather have a rest day on a work day or a day off? A work day. I don’t like not doing anything exercise wise for an entire day if I’m not working. I do currently take one of my two running rest days on Saturdays. So, strength training, yoga, swimming, cycling…something will get done. 13. Would you rather run just because or train for a race? While I am actually enjoying training for my marathon, and it is motivating to train for a marathon, at the end of this week (week 7 of 16 in my marathon training), I am a little tired. I’m not getting up so easily at 5:30 or 6:00 am anymore. I mean, I haven’t skipped a run, but this week I did switch my Thursday long run (13.1 miles) with Friday’s shorter run (was scheduled to be 4 miles, but didn’t check my schedule before heading out and ran 5 instead…oops!). I did that because Thursday was super humid and warm and a “cold” front came in Thursday night so it was nice and cool Friday morning for my 13.1 mile run. Hope this doesn't post twice. Ok. So I highlighted your blog to read it. lol nice about the slow cooker. I admire your cooking skills. I order. lol. as for your headaches, I was in the same boat, multiple headaches a day, migraines, everything for plain annoying to killing/light bothering/puking migraines. doc put me on amitriptyline. awesome. as long as I take it daily no headaches. but if you miss a day, I get one. I was diagnosed with migraines and cluster headaches with a clear CT.
Fun "would you rather" questions! 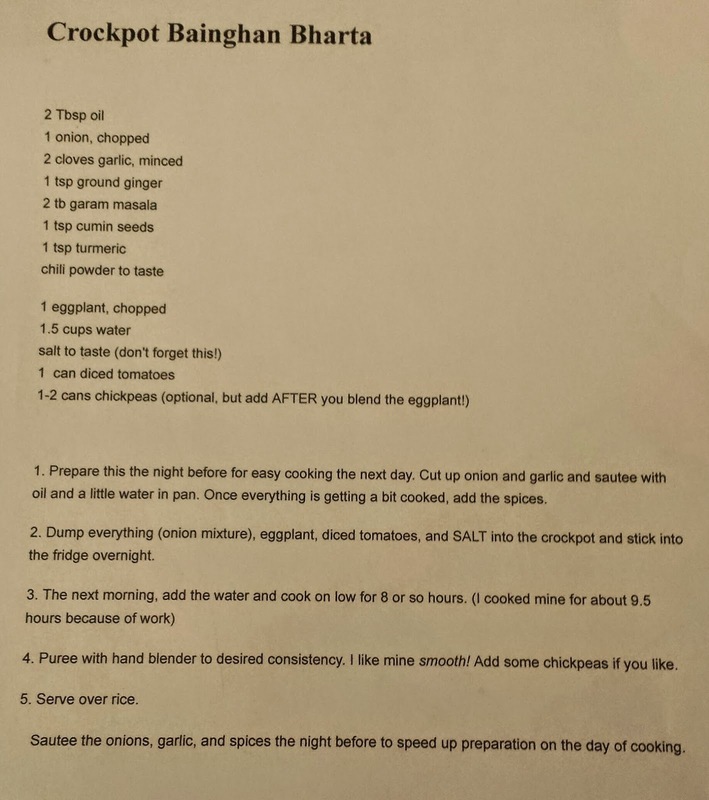 And I printed the eggplant recipe, sounds like it's right up my alley.